Six tanker crewmen of M3 medium tank (British designation "Lee") W-309576 of D Company, 2nd Battalion, 13th Armored Regiment, 1st Armored Division, Combat Command B, II Corps, display ammunition for their 75mm (3 inch) M2 gun during the race to cut off the Axis forces in Tunisia. The gun's breech is visible in the open hatch behind the tankers. 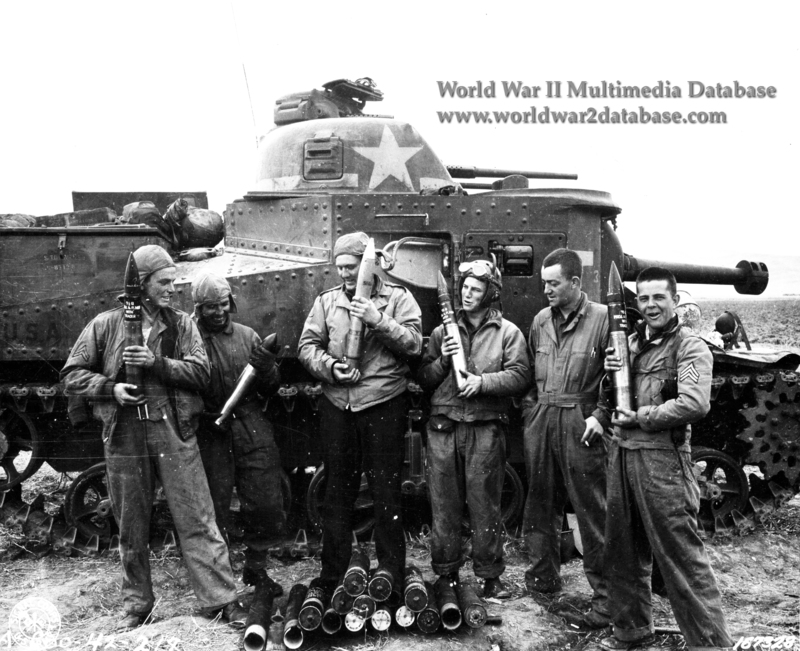 The first tanker is holding the M61 High Explosive/Armor Piercing shot with Ballistic Cap and Tracer (HE/APC-T); The second man is possibly holding an example of the M18 practice semi-armor piercing round; The third man is holding an example of the M48 high explosive round; The fourth and sixth men hold more M61 rounds. Initially the 2/13 was sent to North Africa as part of Operation Torch; the unit at first lacked anti-tank rounds, resorting to firing paint-loaded practice rounds to attempt to blind the optics of German tanks. That may be why the men appear to derisively view the M18 practice round and display the recently arrived M61 anti-tank round. The decision to commit the 1st Armored Division in smaller units had disastrous effects for the Americans; most of 2/13 was wiped out by the end of the Battle of Kasserine Pass in February 1943, and it was the only American medium tank unit to deploy the M3 in front-line combat. Still, the experience gained by the survivors made 2/13 the default choice for combatting German forces, even with their antiquated M3s, which suffered from poor off-road performance and insufficient armor. Like other riveted armored fighting vehicles, when hit in battle, the joints would break up and fly kinetically around the tank, causing casualties. The high silhouette led to the famous tanker remark that the M3 looked like a "damned cathedral coming down the road," and let the British to demand a different top turret without a commander's cupola. Unable to mass their tanks as the Germans did, the 2/13 suffered steady attrition as they were committed piecemeal in stopgap measures to stop Rommel's advance, as did the subsequent regiments of 1st Armored that arrived with the improved Sherman tank. However, the M3 medium gave the British their first weapon that could defeat armor of the Panzer III; the M2 and later M3 gun's ability to fire both anti-tank and high explosive rounds allowed the tank to engage soft targets like bunkers, buildings, infantry columns and anti-tank guns. The high explosive capability of the M3 gun and M48 shells fitted to M4 Sherman tanks remained superior for the rest of the war, but the increasingly heavy German Tiger, Panther and later Panzer IV tanks could not be damaged by the M61 or the later M72 anti-tank shot.